Well the swell did arrive and it was just about enough for Jaws to break. We headed to the cliff in the morning to take Nayra's mum to see it. Not massive Jaws, but pretty impressive watching the guys paddling into it. Also Kai Lenny and Laird Hamilton were out on the SUP's and catching a few of the lefts, again pretty impressive to see. The Starboard team apparently sailed it later, with Scotty, Boujma and Kev getting a few waves each. Hookipa was a bit of a mess, so Nayra and I headed to Kanaha, where it was small, easy and a lot of fun. 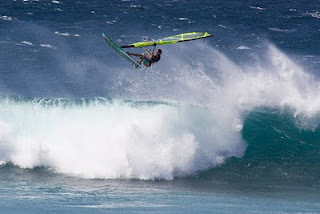 Had about 50 waves which was nice compared with Hookipa which would have been about 3! The next day was really fun though, with the swell dropping a bit and the wind staying around. So far its been howling windy everyday. It is forecast to drop a bit this week, but at the moment its showing no signs of backing off. Thanks to Rossi from the Tricktionary for the photo.